Okay, let’s start at the beginning. The beginning was getting onto a bus headed for a Guatemalan coffee plantation, where I would also be … wait, that’s not quite the beginning. Let’s go back a bit further. 1. I could go on a tour of Antigua, once capital of what we now call Guatemala, at least until a volcano flooded them out. No, you read that right: flooded. There are three volcanos in the neighborhood of Antigua. One of them had a caldera that had collected a large reservoir of water over the years. There was an earthquake and the caldera burst, sending the proverbial wall of water down onto the city. Everyone who had thought that they were all set because they’d bought volcanic eruption insurance? Well, not so much. Anyway, Antigua was supposed to be very pretty: cobblestone streets, beautiful architecture, markets with “authentic” Mayan-descended people. In foreign countries there are ALWAYS “authentic” natives somewhere close by. Strange that visitors to the United States don’t go on tours where they are promised that some Native Americans will dress up in traditional garb and try to sell them stuff. Oh, wait, there’s Texas. Never mind. 2. I could pay somewhere in the neighborhood of $580 and fly (hopefully, for that price, in my own personal Lear jet) to the northern part of the country and visit two of the largest ruins of what had once been the Mayan Empire. This tour looked great. I was keen to go. I was psyched about it. A day spent poking around ruins, taking cleverly-framed pictures? Oh yeah. Except that I only had $60 to spend on a tour. 3. I could go to a coffee plantation and see how coffee beans were grown and processed. This would be fascinating, since I was such a big coffee drinker and … wait, I don’t drink coffee. In fact, I’ve been off of caffeine for about three years now, but even BEFORE that I didn’t drink coffee. My girlfriend back home drank coffee, though, so at least I could, I dunno, buy her a t-shirt with a giant coffee bean on the front or, I dunno, maybe a coffee mug. 4. Go to a plantation that grew stuff I had virtually no interest in PLUS, for a small added fee, IF YOU ORDER NOW, a zip line canopy tour on the side of a volcano. I’d never been zip-lining before (Is that a verb? Noun? Gerund? ), but driving past the one in Branson, Missouri, had whetted my appetite. Also, there was a character in a novel I was working on that did a lot of things like zip lining, so I figured the personal experience would be a good way to add realistic detail to the story. We rattled up the side of the volcano on stereotypically-narrow roads in open-sided trucks that looked like they were about to be used to storm the Costa Ricans in a takeover bid. I was able to look over the side of the truck and straight down to the bottom of the volcano’s slopes. Neither of the two trucks slid off into the abyss, however, and we disembarked safely. Then it got scary. 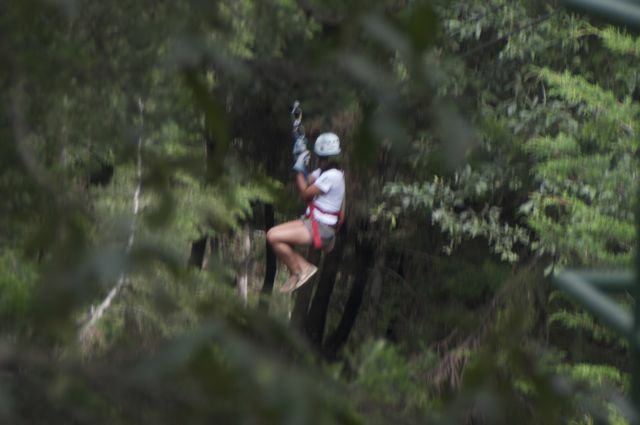 The idea of zip-lining involves strapping yourself to a cable that has been strung between two very tall places, the place at the receiving end not quite as high as the place at the, erm, leaving end. Then you slide between said places, suspended only by a harness and the trust that the cable had been engineered by someone who hadn’t been involved in Minnesota bridge construction. A guide helped me to don the aforementioned safety harness, which was essentially a set of a half dozen canvas straps that seemed to have been designed expressly to pinch sensitive parts of the male anatomy in uncomfortable ways. There were various carabiners hanging off the ends of some some of the straps — the guide told me not to mess with those. However, I was allowed to put on my own helmet. Well, the guide set it on my head and fitted the strap under my chin, but I was able to complain about the fit afterwards. 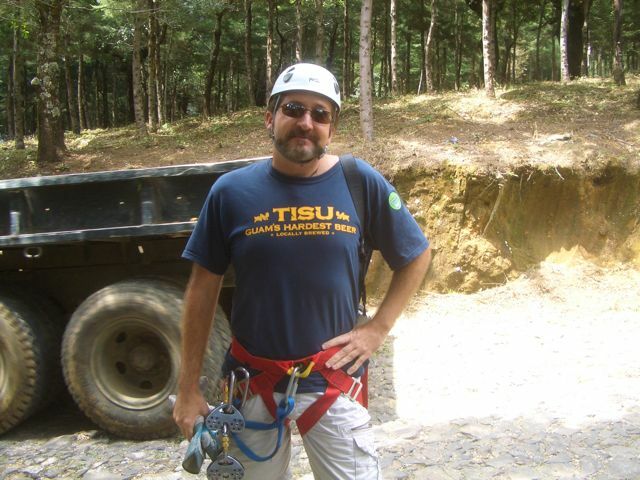 The author is all geared up and ready to go zip-lining. A short wait in line and then it was my turn. First, more guides hooked my carabiners in some arcane and intricate ways to a cable strung between what looked for all the world like tree houses built high in the forest canopy of the volcanic-ash-fed jungle. For some reason, I had agreed to hook myself to a string that was who-knew-how-high above the ground and then slide down it like I was Indiana Jones or something. What had I been thinking? There was spinning involved, there was bobbing, there was waggling, there was more yelling. Pretty sure I was upside down at least once. Or at least the picture I managed to take was upside down. Sliding down a cable at high speed many, many feet above the ground. Yup, good idea. Then we did it five more times, each successive zip line longer than the one before it and higher off the ground. By my rough calculation, the last one was five miles above the surface of the Earth and somewhere in the neighborhood of seventeen miles long. But afterward, when we had bounced back down the mountainside in our Costa Rican invasion trucks and survived that too, I learned about my friend and yours, the coffee bean. It was very relaxing. Good for you, Patrick. I’ve been thinking of trying that. Not so sure I want to now, though. Glad you made it back to ground!